Taiwanese startup Health2Sync announced their strategic partnership with Taiwan's Ministry of Health and Welfare (MOHW) in bringing online diabetes care nation-wide. 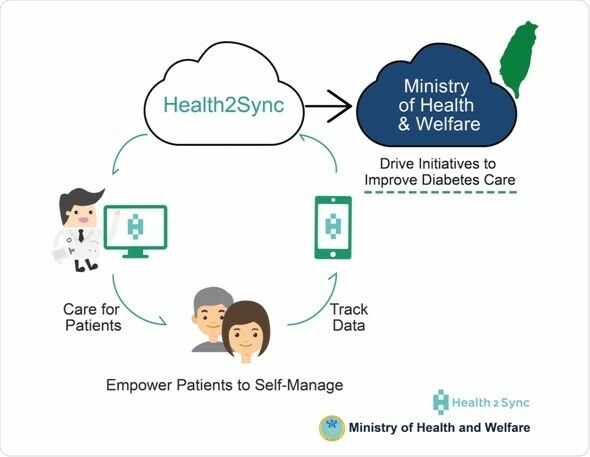 Health2Sync partners with Taiwan’s Ministry of Health and Welfare in Asia’s first government supported online diabetes care program. Health2Sync's mobile App and web management platform raises the effectiveness of diabetes management on a large scale. Since September 2016, MOHW and Health2Sync together have enabled more than 30 hospitals and clinics to provide real-time tracking and immediate feedback to patients. Health2Sync's hardware-agnostic software reduces the cost and time to administer remote diabetes care significantly, enabling diabetes care to scale quickly and effectively. While Taiwan has been viewed as having comprehensive social health coverage, diabetes and its complications have always been costly to Taiwan's National Health Insurance. By using Health2Sync's industry-leading Patient Management Platform and automated care functionality, care providers can support patients to effectively control diabetes on a large scale, and benefit the overall health system as well through reduced hospital visits and related expenditures. For patients, risk of long-term complications can be reduced through proper medication regimen and self-management while maintaining a high quality of life. "To extend the principles of diabetes shared care service, and to allow patients and care providers to battle diabetes together, we want to leverage digital technology and data analytics to provide patients and care providers a mobile App and web management platform that can raise the effectiveness of diabetes management," said Hsiu-Mei Chen , Section Chief, Department of Nursing and Healthcare, Ministry of Health and Welfare . "Through this, we want to motivate patients to self-manage, merge online and offline resources, and enable comprehensive care for diabetes!" "We commend this initiative taken by MOHW," said Ed Deng , Co-Founder and CEO of Health2Sync. "Health2Sync is excited to be assisting one of the best diabetes care programs in the region, scaling it through technology, and we hope to build on this experience to bring similar models to other countries in Asia." Diabetes is recognized as the fastest-growing health problem in the world. Globally, diabetes affects at least 415 million people and over half of them are in Asia . Health2Sync is building similar management programs with partners in Japan , Hong Kong and Thailand . Digital tools that help personalize treatment strategies for each patient enable precision medicine to come into play in the unrelenting challenge of diabetes. While empowering patients is critical, we are constantly seeking tools and methods to further equip diabetes educators. What MOHW and Health2Sync have done is the first step to closing the loop of patient self-monitoring and providing feedback.